Graham Cox: How did you get started as an affiliate marketer? Allan Gardyne: My first online business was selling recipe ebook I wrote for people who, like me, have celiac disease – an intolerance to gluten. I sold my first ebook in May 1996, although at that time I’d never heard the word “ebook”. I called it an “electronic book” – and then had to explain what that was! To learn how to market my website, a bought a little book by Jim Daniels called “Insider Internet Marketing”. Jim offered his customers the option of signing up as an affiliate and receiving commissions from sales. The book was very helpful, so I signed up. I collected hundreds of Internet marketing tips from everywhere I could find them and put them on a new website. As one of the tips, I recommended that people buy Jim’s book. I earned about $10 from each sale. 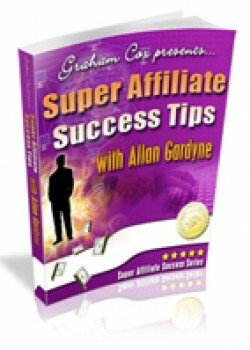 Graham Cox: You’re probably best known for your affiliate directory AssociatePrograms.com. How did the idea for that site come about and why do you think it has been so successful? Allan Gardyne: I liked those $10 commissions. I wanted to join more affiliate programs like Jim Daniels’ so I hunted in all the main search engines for a directory of them. I was surprised that no one appeared to have created one. I reckoned that many people like me would be searching for a directory of affiliate programs, so I started one. Apparently, one did exist, but I couldn’t find it.